In this massively researched, lucidly written and cogently ar gued narrative, Kenneth Levin tells the appalling story of what has been called the greatest self-inflicted wound of political history: Israel's embrace of Yasser Arafat and the PLO in the Oslo Accords of September 1993 and its dogged adherence to its obligations under them even as its "peace partner" was blatantly flouting its own. The book is divided into two sections. The first recounts Jewish political failure in the Diaspora, where Jews lived with a constant burden of peril, as the background for the self-deluding rationales that engendered Oslo. The second traces the same self-delusions in the history of Israel itself. Levin shows how a tiny nation, living under constant siege by neighbors who have declared its very existence an aggression, was induced by its intellectual classes to believe that its own misdeeds had incited Arab hatred and violence, and that what required reform was not Arab dictatorship and Islamicist anti-Semitism, but the Jews themselves. Reversing cause and effect, Israeli leaders blinded themselves to the (obvious) fact that it was Arab hatred and aggression that repeatedly led to Israeli occupation, not occupation that caused Arab hatred and violence. Although Levin argues strongly that Israeli leaders like Yitzhak Rabin, Ehud Barak and the ineffable Shimon Peres hallucinated moderation in a murderous enemy, his book is not a polemic that excludes all opposing points of view; on the contrary, we get the fullest possible account, and "in their own words," of those Israelis (and their American-Jewish supporters) who deluded themselves into believing that Oslo would bring a new heaven and a new earth. When the accords were signed in 1993, Minister of Education Shulamit Aloni announced that "no more parents will go weeping after the coffins of their sons" and Israeli novelist and "peace activist" Amos Oz said confidently that "death shall be no more." And all this because Arafat had — not for the first time — promised to renounce terror and recognize Israel's "right to exist." It was the used Buick he had already sold several times over. By autumn 2000, and as a direct (and in Levin's view entirely predictable) result of Israel's endless unreciprocated concessions to Arafat's demands, the country was faced with Intifada II, "the Oslo War," in which all Israel became a battlefield, and getting on a bus or going to a cafe or a disco meant risking your life. One of Levin's central themes is the influence of Israel's cultural elites on the governments of Rabin and Barak. In Israel as in America the motto of many intellectuals is "the other country, right or wrong"; but whereas in America leftist intellectuals now aspire only to take over the universities, in Israel they aspired to (and in one sense did) take over the government. The consequence: Israel was soon reminded of Churchill's judgment of England's intellectual appeasers: "Mr. Chamberlain was faced with a choice between surrender and war; he chose surrender, and he got war." Edward Alexander is author of "Irving Howe: Socialist, Critic, Jew." E-mail: eaengl@u.washington.edu. First published in AM New York. "We have ruled the world before, and by Allah, the day will come when we will rule the entire world again... We will rule America... [and] Britain and the entire world - except for the Jews. The Jews will not enjoy a life of tranquility under our rule... Listen to the Prophet Mohammed, who tells you about the end that awaits Jews. The stones and trees will want the Muslims to finish off every Jew." So declared a Palestinian religious leader, employed by President Mahmoud Abbas' Palestinian Authority, in the May 13 weekly sermon broadcast on official Palestinian Authority television. The messages in this sermon have been promoted by Palestinian leaders for decades and have been standard fare in media, mosques and schools throughout much of the Arab world. The indoctrination to hatred, genocide and conquest is a symptom of what one rare liberal voice in the Arab world, the Tunisian human rights activist Muhammed Bechri, recently called the "twin fascisms" of Islamism and pan-Arabism. Why did Israel enter into the Oslo agreements with an adversary so clearly intent on pursuing its destruction? The psychology of Israel's Oslo supporters resembles that of children abused by their parents: Such children typically blame themselves for their predicament because they want to stave off hopelessness. They choose to see the fault in themselves because doing so keeps alive a hope that by reforming, by ingratiating themselves, they can change their parents' behavior. In the same way, persistently besieged communities, whether minorities under constant attack or small nations besieged by surrounding neighbors, commonly delude themselves into thinking that self-reforms and concessions will placate their enemies. Israel has paid a grim price for its Oslo delusions in a terror war launched by "peace partners" that has left well over a thousand Israelis dead and many thousands maimed. As Americans, we were not, of course, in the same predicament as Israel. The hatred against us was only occasionally translated into physical attacks and those strikes were limited. But the United States suffered a new type of assault on September 11, 2001, and, even though we remain the most powerful nation in the world, many among us have reacted in the manner of persistently besieged groups. Indeed, blaming America for the threat is the standard line in significant segments of American academia and media. Many insist we follow the lead of the United Nations in addressing the terror challenge. The UN has routinely coddled terror-promoting states and has failed to respond forcefully even to their acts of genocide. It has viewed Sudan and Saudi Arabia as fit for membership on its human rights commission and it chose Libya to chair that commission. Why American media pundits and political leaders would urge us to bend to the UN in fashioning our own actions in the terror war is difficult to understand except as the delusional view of people determined not to look honestly at the threats we face. Turning our eyes from the actual challenge cannot help but sap our capacity to fight the war in a way that might minimize the losses we are yet to suffer. Last week, the president of the United States effusively praised Mahmoud Abbas, Yasser Arafat's right-hand man for some 40 years. In the White House Rose Garden, Mr. Bush described Mr. Abbas as a "man of courage," explaining he takes "great faith in not only [Mr. Abbas'] personal character, but the fact that he campaigned on a platform of peace -- he said, 'Vote for me, I am for peace.' And the Palestinians voted overwhelmingly to support him." In light of what is actually happening in the proto-state Abbas (a k a Abu Mazen) was elected last January to govern, such characterizations seem at best wishful thinking, at worst willful and dangerous self-delusion. As a new Web ad (www.CenterforSecurityPolicy.org) makes clear, if the Palestinian people truly want peace, there is very little evidence they are moving in that direction under Abu Mazen. To the contary, Mr. Abbas is not dismantling terrorist organizations. Instead, groups like Hamas with the avowed mission of destroying Israel are ascendant. They are winning local elections and taking full advantage of the "hudna" (temporary suspension of hostilities) to rebuild their offensive capabilities against Israel. Hamas and other terrorists are being integrated into Palestinian security forces, receiving valuable training and even arms from U.S. and European personnel. Burgeoning quantities of ever-more-powerful weapons are smuggled into Gaza from Egypt. Meanwhile, Palestinians are encouraged by official imams whose sermons are broadcast on Abbas-controlled media to kill Jews and destroy America. For example, less than two weeks before Mr. Bush welcomed Abu Mazen to the White House, Sheik Ibrahim Mudeiris claimed on Palestinian Authority TV that history showed the legitimacy of torturing, exiling and murdering Jews and Muslim conquest of the U.S. inevitable. If the evidence is so clear the Palestinian state Abu Mazen is a-building will be but a new state-sponsor of terror, how could President Bush -- who in June 2002 rejected that prospect and devoted his presidency to eliminating such sponsors -- possibly turn a blind eye to the facts on the ground? How could he insist Israel make still further territorial and political concessions, including over Jerusalem, let alone hand over directly to the PA $50 million in U.S. taxpayers' funds? Call it "the Oslo Syndrome." This is the title of an important new book (Smith and Kraus Global, 2005) by Dr. Kenneth Levin, a psychiatrist and historian who is a clinical instructor at Harvard Medical School. As the subtitle -- "Delusions of a People Under Siege" -- makes clear, Dr. Levin is concerned with a pathology that has prompted Israel's Jews to embrace the false promise of peace ostensibly on offer first from Mr. Arafat, now from his former right-hand man. A similar malady seems to afflict official Washington, as well. Dr. Levin describes the roots of this pathology: "[It] lies in psychological responses common among chronically besieged populations, whether minorities subjected to defamation, discrimination and assault or small nations under persistent attack by their neighbors. People living under such stressful conditions often choose to accept at face value the indictments of their accusers in the hope of thereby escaping their predicament." 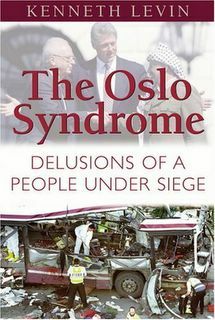 "The Oslo Syndrome" chronicles delusions of successive groups within the Jewish world, with a particular focus on the most prominent and contemporary of the phenomena -- that of politicians and organizations associated with "the Peace Movement." Dr. Levin explains:"The Peace Movement's stance in fact was as divorced from reality as had been German Jews' blaming of Polish Jews for anti-Semitism, or secular European Jews' blaming of the religious, or socialist Jews' blaming of the Jewish bourgeoisie. But proponents of the Movement, cowed by the persistence of the siege and desperate to see its end, chose to delude themselves. They grasped at any seemingly positive statement coming from an Arab political figure and ignored all the countervailing evidence." For example, the self-deluded chose to ignore unwelcome statements by Faisal al-Husseini, an Arafat and Abbas crony who was for years the Palestine Liberation Organization's proxy representative in Jerusalem. Mr. Al-Husseini declared in 2001 that the Oslo "peace" accords of 1992 between Israel and Arafat were but a "Trojan Horse," designed to advance the Palestinians' abiding goal of liberating their "country," whose boundaries would be "from the [Jordan] River to the [Mediterranean] Sea." In other words: No Israel. Mr. Al-Husseini's ambitions were of a piece with those long espoused by his relative, Haj Amin al-Husseini, the notorious grand mufti of Jerusalem, whose complicity with Adolf Hitler helped advance the Fuehrer's "Final Solution" for the Jews and deny the latter refuge in their historic homeland. Incredibly, even the Holocaust Museum in Washington -- a magnificent institution designed to serve as a conscience for all time -- is in denial and contributing to the Oslo Syndrome: It refuses to include in its permanent exhibition anything about the mufti's role in past Arab anti-Semitism, or to address manifestations of this systemic racism now so evident in the Muslim world. Dr. Levin notes in an article published at www.JewishPress.com: "The ongoing Arab siege does cast a shadow over the lives of Israelis. At the same time, they have created a free, vibrant, extraordinarily successful society. It remains to be seen whether they are prepared to go on nurturing what they have built as they await changes in the Arab world that will open it to genuine peace, or they will instead, in their eagerness for 'normalcy' and an end to the siege, once more delude themselves into pursuing fantasies of peace that will threaten everything they have created." Or, he might have added, whether the U.S. government will, in its own act of self-delusion, encourage or compel Israel to do the latter?